« See What’s New in C3! Tomorrow night, July 13, we are celebrating Mexico of the past and present with our Second Thursday program, Off the Wall to kick off our closing weekend of Mexico: 1900-1950. Since this exhibition is all about telling the stories of Mexico and the artists who documented its history and people, we thought Once Upon a Time in Mexico would be the perfect way to encapsulate the evening. We have so much going on all evening, tours, music, crafts, and more and each activity connects back and tells a story about an artwork in the exhibition. Murals are such a large portion (literally) that connects the exhibition together, so we wanted to highlight murals as an art form. All night you will be able to watch as the artist collective Sour Grapes create a mural inspired by the exhibition on Eagle Family Plaza. Sour Grapes has been around since 2005 and you can’t drive around Dallas without seeing their work on walls and buildings. Even though we have a few murals to choose from, this one was a visitor favorite and with its bold colors and the scale of the work, you can see why. 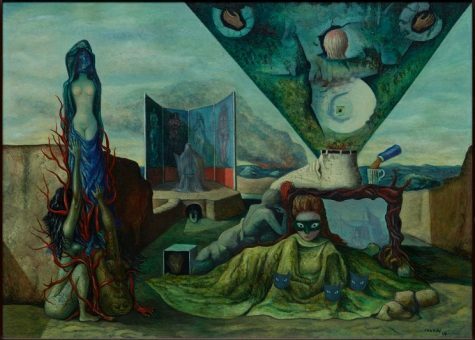 Artists like, Gunther Gerzso, Leonora Carrington, and Alice Rahon, all featured in the exhibition, were important players in the Surrealist movement in Mexico. 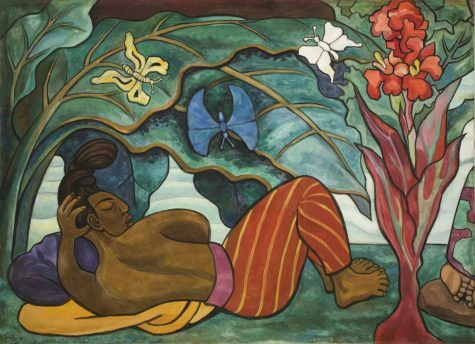 This movement encouraged artists to unlock their subconscious and use their imagination to create a new world on the canvas. Spend a few minutes with friends putting yourself into the minds of the Surrealists with the game, Exquisite Corpse. In the game, a piece of paper is folded into sections and passed around; the challenge is that each artist must work on one particular segment without having seen the others. The results are sometimes crazy and monstrous but always hilarious. On the Before Mexico, was Mexico tours, we have Dr. Kimberly Jones the DMA’s Assistant Curator of the Arts of the Americas speaking on our Pre-Columbian collection in English and Spanish. Pre-Columbian art was an enormous influence on many of the artists represented in the exhibition. Just one example is the mural by Saturnino Herrán entitled Our Gods, which shows a group of Aztec people during a ritual to the god, Coatlicue. To finish up your night, don’t miss Mariachi de Oro performing the upbeat music of Western Mexico. Mariachi has been around since at least the 18th century and is a large part of Mexico’s cultural history. Around the 1920’s when the piece below was painted, Mariachi music was being broadcast on the radio for the first time, and instruments like the trumpet were being infused into the arrangements because of the growing popularity of jazz and Cuban music. Don’t miss out on a fun filled evening celebrating the closing weekend of Mexico: 1900-1950. We are going to miss this exhibition once it is gone next Monday, but thankfully, we have a few pieces that are staying with us! These images below among others will still be in the DMA’s collection and can be enjoyed many times to come after Mexico is over. Rufino Tamayo, “El Hombre (Man),” 1953, pigment in vinyl emulsion on Masonite, Dallas Museum of Art, Commissioned by the Dallas Art Association through Neiman-Marcus Exposition Funds,1953.22, © 2012 Estate of the artist in support of Fundacion Olga y Rufino Tamayo, A.C.
Don’t forget to join us tomorrow from 5:00-9:00 p.m. for July Off the Wall: Once Upon a Time in Mexico. The cost is $5 for the public and free for DMA Members. An additional $10 ticket is required to see the exhibitions that evening.